Marjory Bassett, VCCA Fellow and writer, died on January 18, 2009, in New York City, at the age of 88. She was an amazing and vibrant character–a vivid presence at the VCCA during fourteen writing residencies from 1985 to 2001. Marjory’s memorial service will be held at the National Arts Club (NAH) in New York City on Monday, February 2 at 4 p.m. Long-time chair of the Literary Committee at the NAH, Marjory published fiction and nonfiction in various magazines and newspapers, including the Philadelphia Inquirer and Newsday. Her novel, Never Say Start Naked, was published in 2002. Thanks to a generous donor and help from local appliance retailer Burch-Ogden, a longtime fixture on Main Street Amherst, VCCA Fellows will sleep a little easier on brand new Pillow Premium mattress sets. The current mattresses are about 15 years old and will be swapped out gradually as bedrooms are vacated. The new cache includes four extra long twin sets for the comfort of our taller Fellows. The old mattresses will be transferred to the studios. Sweet dreams everyone! Photo: VCCA grounds gurus Mike Patterson and Bruce Hartless unload the much-needed new mattress sets. Be sure to check out Garrison Keillor's Writers Almanac again tomorrow for another poem by Alan Michael Parker! Fellow's Poem on "Writers Almanac"
Alan Michael Parker's poem, My Son, Under a Waterfall, was featured on Garrison Keillor's The Writers Almanac this week. Click here to listen to Garrison read the poem. A long-time VCCA Fellow, Alan is associate professor of English at Davidson College and the author of three books of poetry and a novel. He is married to the artist Felicia van Bork, also a VCCA Fellow. It is with sadness that we report that longtime VCCA Fellow Julie Portman, died Dec. 21 following a long illness. Her husband, songwriter and VCCA Fellow Paul Reisler has organized a celebration of her life to be held Sat., Jan 31 at the Theatre House in Castleton, VA. Friends are asked to RSVP by emailing reserve@chateauville.org or calling 540-937-8969. There will be a 2:30 showing of Julie's play Conference of the Birds and 4:00 concert followed by pot-luck supper & song circle sharing. Julie was an Obie-award winning playwright, actress, director, storyteller, singer, and teacher. 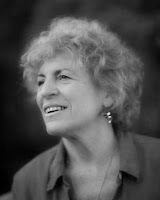 In 1986 she founded Ki Theatre in Rappahanock County, Virginia, and was artistic director there for 22 years. Story was always at the center of Julie’s work on stage, television, as a writer and a master teacher. She was the creator of the Life Stories Workshop Process, which empowers people to become the author of their lives.